Welcome to the last day of #CU10Dot. We’ve covered lots in the last two weeks and it’s been fun and informative putting the #CU10DoT blog posts together. This is the third time I’ve run #CU10DoT and each time there have been a number of changes to incorporate. This time included: the increase of Tweet character limit from 140 -280, the very recent introduction of bookmarks and the demise of Storify. I searched for a replacement for Storify and am going to try Wakelet in the future. I’ve had my submission to PressED – a WordPress Twitter Conference on all things education, pedagogy and research accepted. My contribution on the topic of #CU10DoT is scheduled for for 11:50 am on March the 29th 2018. Look out for articles, blogposts and websites that mention using Twitter for academics. When you discover something useful, let us know by tagging with #CU10DoT! Thank-you to those who’ve joined in. Please let me know your thoughts about #CU10DoT in the comments and/or Twitter. Twitter is ephemeral. Tweets are short, throwaway observations, which capture the present moment, flow past quickly and are succeeded by more recent and relevant ones. Why would you want to keep a tweet? Why would you want to tweet in advance? Let’s look first at deleting. You can delete your own tweets by clicking the ‘dots’ icon located underneath the Tweet next to ‘reply’, ‘retweet’, etc. From the menu that appears simply select ‘Delete Tweet’. If you make a mistake in a tweet, it might be less confusing to send another tweet with a correction rather than delete one that people may already have seen. However, you can’t delete someone else’s tweets, so if they’ve already retweeted you, taken a screenshot or archived the tweet using some of the options below, it might be too late to stop your tweet been recirculated! What if you want to keep tweets, either your own or someone else’s? Why might you want to do this? Maybe you want to keep a record of all of the tweets from a particular module instance. If you want a copy of all your tweets, then Twitter can send you an archive of everything you’ve tweeted. Click on the profile icon, and select ‘Settings’. On your ‘Account’ page, scroll down to the bottom where you will see an option “Your Twitter archive: Request your archive”. This might be useful if you are using Twitter with your students and you want to capture all your tweets to demonstrate what you have done over a semester (or year) to external examiners etc. Bookmarks are a recently added feature – an easy way to save Tweets for quick access later. You can save, curate and share tweets using third party applications such as Wakelet. Wakelet is a way to create a narrative out of linking to content on the web including tweets, websites and blogs. Wakelet is a really nice way to curate, create and share a summary of tweets and other online material around an event or discussion, such as a conference, blog, module or livechat. If you want to release a link to an article, or lecture recording, to students after a lecture or seminar. You can schedule tweets from both Tweetdeck and Hootsuite. To schedule a tweet in Tweetdeck, write a tweet as normal, and then click on the clock icon at the bottom of the window you’re composing a tweet in. This brings up a small calendar, where you can choose the time and date when you want your tweet to be sent. You could also use an app called Buffer. You can sign in with Twitter (or Facebook, or LinkedIn), add an email address, and install it to your browser. Once signed in, it will ask you what you want to share. Type in a tweet, and click ‘buffer’. You will want to go to the ‘Schedule’ tab and set the timezone, and the day and time you want to tweet! There’s quite a bit there to play with! Don’t worry if you’re still catching up – so are others, and hopefully the conversation will be continuing on #CU10DoT for quite some time! Over the last 7 days, you may have found that as you continue to use Twitter, you come across more and more interesting people to follow, and your following also grows exponentially. Keeping track of them all can be a challenge, and sometimes you will want to focus on certain groups of them over others, or check in on some people only sporadically. This is hard to do in the undifferentiated stream of tweets on your Twitter feed, where they are all mixed in together. Fortunately, there are ways to split up your Twitter stream and group the people you follow into separate streams, so you can keep an eye on their tweets as it suits you. Twitter has a feature which allows you to make lists of people – and you need not follow all of them to add them to a list. These lists can be private, so only you can see them, or they might be public so you can share them with others. You might create such a list for the benefit of others, for example, to bring together the attendees at a workshop or conference, or the top accounts on a particular topic which you recommend other people should follow. You can share a list by giving people the URL of the list page, or let them view the lists you’ve created on your profile, where they can subscribe to your lists too. Go to your profile icon at the top right of the page (beside the Tweet button). Select ‘Lists’, and you will see a page which will contain any lists you will make. Click on ‘Create list’, and you will be asked to name your new list and add a brief description. This description will be very helpful if you now choose to make the list public, so others can find and subscribe to it. You will now be invited to search for people to add to your list. You can also add them later, by clicking on their @handle and going to their profile. Next to the ‘Follow(ing)’ button, you will see the Settings icon (looks like a cog or gear). If you click on this, you will see a menu containing the option ‘add or remove from lists’ (this is also where you can send them private Direct Messages, as in Day 4). While we’re on the topic of managing people, you can also block or report people using this menu, for example, if you are followed by a spam account or someone you don’t want following you. The quickest way to add a lot of people you are already following to a list is to go to your profile page, click on Following. Then you’ll be able to click on the cog beside each person you want to add to your list. To view tweets from your lists, you can simply go to your Twitter profile page and click on ‘lists’ from the toolbar above your tweets. You can benefit from other people’s connections and effort by subscribing to lists they have created. You can even follow lists without following the individual users in that list. Decide which list you’d like to subscribe to and click on the title. From the list page, click Subscribe (upper left) to follow the list. I’ve started to compile a list of ‘Coventry Colleagues’ that you may like to subscribe to. Think about the kinds of updates you’ve seen on Twitter so far from the people you follow. Who do you most want to see tweets from? Try making a list of your colleagues on Twitter, or perhaps one for the professional and funding bodies you follow. Share a link to your list by tweeting it or posting it in the comments section below. Hashtags (using the # symbol) is where Twitter really gets interesting. Today is therefore a little more complex than usual, apologies! The hashtag is, like the @message, a feature that was developed by users of Twitter, and was taken up and integrated by the platform as it was so useful. Basically, the hashtag is a form of metadata. A # in front of a word signals that it is a keyword of some sort, tagging that tweet with a hash symbol (hence hash-tag). This means that you can easily search for all other tweets by other people containing that word similarly marked with a hashtag symbol. In fact, you don’t even need to search – if you click on any hashtagged term, it will search for you. The hashtag for 10 Days of Twitter is, as you’ve guessed, #CU10DoT. You can therefore search for any tweets containing that hashtag, whether you follow the people using it or not (if you’re a Mac user and wondering where your hashtag key is, there isn’t one! You’ll need to press the alt key and the 3 key together to make the # symbol!). A hashtag needs to be a single word, preceded by a #symbol, with no spaces or other characters. It doesn’t need to be a real word – it can be an acronym of some sort, like #CU10DoT, and it needs to be understood, known or guessed by the people it’s relevant to. It could even be several words run into one (which counts as one word!) such as #ILoveTwitter (it can help to capitalise the individual words to make it easier to read). What it should be above anything else, though, is short, so that it doesn’t use up too many characters! How do you know what hashtags to use, or to search for? You make them up! If you’re creating a new hashtag, it’s good to do a search first and check if it’s been used before, and if it has been used before, whether you are going to use it in a similar way for similar people. If so, you’re joining a larger, pre-existing conversation! If not, then you might be confusing things, with a hashtag meaning different things to different people. If you’re talking to a limited, known group, as I am here, or as you might at a conference, then the hashtag might be meaningless to outsiders (which is probably fine – people for whom it’s relevant will probably be aware of it already or easily figure it out). If you’re creating a hashtag hoping to start a larger discussion which is open to anyone, then it needs to be self-explanatory and something that someone might very likely search for or guess, like #highered. You’ll see people using hashtags you might be interested in when scanning your twitter feed, and if you click on the hashtag you will find all the other tweets using that hashtag recently. Or you can search for hashtags using the search box at the top. If you click on the ‘#Discover’ tab at the top of the screen, you’ll see the top hashtags that the people you follow are currently using. When you hear the phrase ‘trending on Twitter’, it means that there are a lot of people talking about the same thing, using a common hashtag. You might also ask for suggestions from your followers. Someone might start a discussion about a topic on Twitter which is open to all to contribute, and it is drawn together using a commo n hashtag. #Twittergate (see Livetweeting below) is an example. You can also use it to gather responses. #OverlyHonestMethods is an amusing way for researchers to share the real thinking behind their methods, and give the public an insight into how research is done. 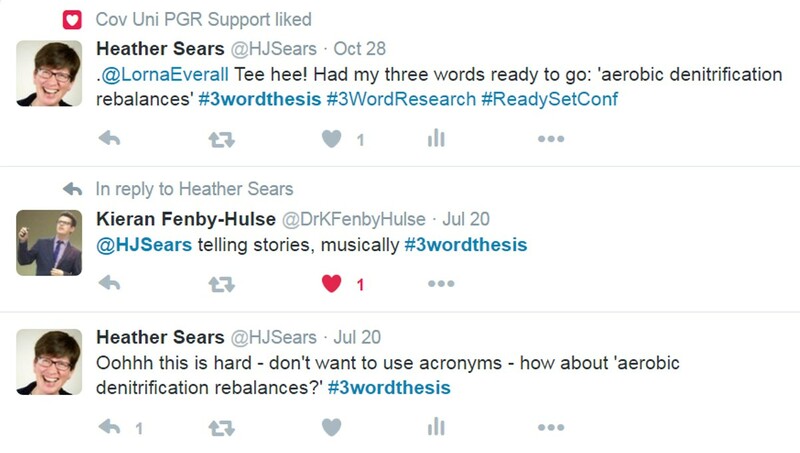 You could contribute to #tweetmythesis – I had to hunt down my thesis to compose mine! A live chat is a conversation on Twitter which takes place in real time. A topic, time and a hashtag is agreed by the leaders, and they are joined on the day by people who want to talk about that topic with each other. Livechats can be fast and furious, but a great way to discuss, make new contacts and share experiences. Popular ones which you might be interested in are #PhDchat and #ECRchat, which deal with the experience of being a PhD student or postdoc, and might offer some moral peer support! To livetweet an event means to tweet about it while you’re actually participating in it. Conferences or seminar presentations are often livetweeted. If you follow me, you may have picked up on my livetweeting of conferences I might attend such as the Researcher Education & Development Conference #redsconf2017. This may be done in an official capacity, with organisers inviting participants to livetweet the papers, giving attendees a pre-agreed ‘official’ hashtag to use, running up to the event, during and after, to find out who’s going to be there, what the papers were about, and any follow-up questions. A live stream of the tweets at the conference may even be displayed alongside the speaker on a ‘tweetwall’, using a tool such as Hootfeed. If you’re at a conference, livetweeting it is a great way to connect to other attendees. It’s easier to approach someone when you’ve been ‘talking’ to each other already on Twitter, and if you’re at the conference on your own, you can find people to hang out with. You can ask questions or for clarification from the presenter, from other conference attendees, or in fact anyone on Twitter, during the sessions. You can also enhance what the presenter is saying, with links to more information and comments on their presentation. Livetweeting is very visible, so do keep comments professional. However, livetweeting events must be approached sensitively and professionally. Some presenters may feel that the conference space is a closed group, and feel uncomfortable with their paper being conveyed outside the room to those who aren’t there. They may worry that their ideas and words are being misrepresented in 140 characters. It can also be quite distracting to see people typing away and surfing the internet when you’re presenting, even if it’s relevant! alert your followers that you will be livetweeting so they’re not confused! 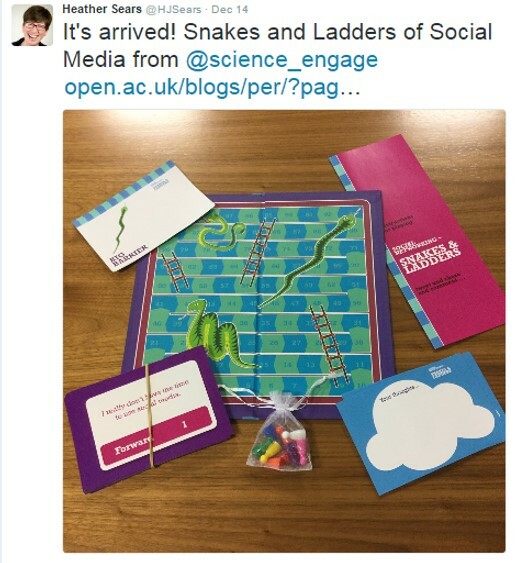 So – look out for hashtags which mark a conversation you’d like to join in, perhaps a livechat, and experiment with livetweeting an event, no matter how small (could even be a TV or radio programme!) If you find any good hashtag conversations, let us know! And remember to tag them with #CU10DoT! You’ve sent a few tweets over the last week – hopefully you’ve found plenty in your everyday routine as an academic which would be of interest to others, whether they are your Coventry colleagues, peers in your field, other professions within or beyond Higher Education such as policy, journalism or publishing, or to the general public. to your followers, by sifting the stream of information available to them, filtering out what’s potentially interesting to them, and also by making them aware of potential new contacts they can add to their network. They may already follow the person you’ve retweeted, in which case you’re bringing their attention to something they may have missed the first time. They may not yet follow the original tweeter, in which case, you’ve made available to them information they may not have had access to, and given them a new contact to follow. and of course, you’re displaying to others that you’re well connected to interesting and important people, and that you are a discerning judge of what information is interesting and significant! I’ve been retweeting items I hoped might be of interest to you and my other followers on @HJSears over the last week. To retweet a message, you simply click on the ‘retweet’ button and which appears below each tweet when you hover over it. The message will then appear in your followers’ twitter streams as if it appeared from the original sender, even though they may not follow them (although they might!). The tweet that they see will be marked with ‘retweeted by @yourname’ in small lettering, so if they look, they can tell that it was you who retweeted it. However, as with sending @messages using ‘reply’, if you simply use Twitter’s ‘retweet’ button, you’re missing out on retweeting in the most effective way using Quoting. All you do is click “Retweet” as you normally would but now there is a box with “Add a comment…” that appears before the final “Retweet” button – click to send it live. On iOS you simply select “Quote Tweet” and add your comment from there. The end result is your comment above the original tweet, including the original photo if it had one. So have a look at your twitter stream and see if you can find tweets you think your followers might be interested in – funding opportunities, calls for papers, an item of news, a new blog post or publication someone’s tweeted about, a comment you agree with…and start retweeting! Use the #CU10DoT hashtag if you think it will be of interest to this community. So we’ve covered a fair bit in the last four days. Now it’s time to start making more from the tweets we send, so today we’ll look at tweeting links and images. You can’t say a lot in 280 characters – but you can link to other places on the web where a topic can be discussed at greater length, perhaps in an article or blog post. Maybe you’ve seen a new publication, item of news or a webpage you want to comment on or pass on to your followers. Perhaps you’ve just posted something on a blog or website, uploaded a resource or published an article and you want to encourage people to have a look. Twitter works really well as a way to bring people’s attention to other, longer things online. You can simply copy and paste a website’s URL into a tweet. However, many URLs are pretty long, and even if they fit into 280 characters, it leaves less space for you to add a contextualising explanation or comment which will encourage people to click on the link. Fortunately, Twitter has an inbuilt URL shortener, which will cut the link down to 20 characters. When tweeting a link, it’s good practice to begin your tweet with a brief comment explaining what it is and why you’re tweeting it. A URL by itself doesn’t necessarily say much about content or provenance, and a shortened URL using one of the above services gives nothing away at all about what it is. Your followers will likely ignore your tweet and the link if they can’t immediately see what it’s about, where it’s from and why they should be interested. It might be assumed that by sharing a link, you are endorsing the content so, if not, a comment stating your stance on it – do you agree, or disagree? – might be appropriate. Or is it simply that you found it useful and think your followers might too? So what might you link to? something you’ve uploaded yourself. This blog is set to update automatically on Twitter whenever I post something new (which is why there is a hashtag in the blog post title! It will also become a tweet). Try and personalise the automatic update message yourself if you can. your publications. There’s evidence that tweeting about your research output really helps to increase views, and therefore possibly citations, especially if you follow strategies to get your research mentioned on-line. You’re not expected to spend time deliberately looking for links to tweet to your followers; this is more a byproduct from anything you happen to be doing online anyway. And with more and more sites including a ‘Share This’ button or buttons for the various social media platforms, it’s very easy and quick to do. There is increasing data available (from Twitter’s new analytics service) that suggests tweets with images in them get more traction and attention from other users. So how do we add images? Begin a tweet as normal. If you’re using the web, click Add photo. If you’re using a mobile Twitter app, tap the camera icon to take a photo or to choose an existing photo from your gallery. Once a photo is selected, you will see a thumbnail image or the image file name appear as an attachment. You can select up to 4 images to tweet at once. To remove the image file you selected, click or tap the x on the image thumbnail (or next to the file name). Some mobile Twitter apps will allow you to enhance, apply a filter, or crop an image once you select it. To tag up to 10 people in your photo, select Who’s in this photo? and type in a full name or an @ username and then tap Done. A person’s security settings will determine if you can tag them or not. To remove a tag, tap the tag and then the backspace or delete button. You can only do this before you tweet the photo. You can’t remove tags from a photo once it is tweeted. Tap/click Tweet to post your message and photo(s). Your Tweet’s character count will update to include the pic.twitter.com URL for your photo(s). You’re not expected to spend time deliberately looking for links to tweet to your followers; this is more a byproduct from anything you happen to be doing online anyway. And with more and more sites including a ‘Share This’ button or buttons for the various social media platforms, it’s very easy and quick to do. This is part of what we mean by being an ‘Open Scholar’ in the digital age – it costs you very little to share your useful daily digital finds with others, so why not? See what you come across today online, and remember to tweet it to your followers! Try and include an image as well if you can (and don’t forget to include #CU10DoT). Twitter only allows you to send 280 characters, which doesn’t seem much when we are used to writing at length about complex ideas. That doesn’t mean that Twitter is superficial or only used to tweet about frivolous things. Many people, especially in a Higher Education context, who are new to Twitter aren’t sure what to say, or why updates about whatever they’re doing would be interesting to others. But there are actually many aspects of your day-to-day work that would be of very practical use to others. Have a look at some Twitter feeds from academic tweeters and see what kinds of information they share, to get an idea of how you really can say something useful and engaging in 280 characters. The tone of your professional twitter account needn’t be overly formal – you can be chatty and conversational, and allow your personality to come through. Even if tweeting on behalf of a service, you need to be engaging rather than formal, ‘passing on information’ rather than ‘making announcements’. Do remember though, if you’re tweeting in any professional capacity, that Twitter is a very public medium, and that tweets can be kept, even if you delete them (more on this on Day 9). As a rule of thumb, don’t say anything you wouldn’t normally say openly in a work context! Type your Tweet into the box at the top of your Home timeline, or click the Tweet button in the top navigation bar. Make sure your update is fewer than 280 characters. Twitter counts the characters for you! You will immediately see your Tweet in the timeline on your homepage. Read about posting Tweets via the Twitter for Android app and via the Twitter for iPhone or iPad app. Remember – you’re only able to write 280 characters including spaces. Once you go over the limit, the small counter in the tweet box will start to count in minus numbers to highlight how many characters you need to delete. You’ll soon develop a suitably concise style, and learn the tricks to abbreviate your writing, such as using ‘&’ instead of ‘and’. This all adds to the informal tone. Try sending a few more tweets throughout the day. Your first tweets might be just simple messages to ease you in – what are you up to? What kind of event or activity might your intended followers find interesting, personable or quirky? You could let them know about an upcoming event, a thought about your research or teaching, or just show that you’re approachable and share common experiences. Don’t agonise over it though – Twitter is ephemeral in many ways! Welcome to Twitter, and to #CU10DoT! If you already have a Twitter account, jump to Personalising your profile and More than one Twitter account? – use today to refine your profile and think about whether you could make good use of more than one Twitter account. If you don’t yet use Twitter, visit https://twitter.com to set up an account. You’ll firstly need to enter a real name, email address and password to sign up. On the next page, you can select a username (usernames are unique identifiers on Twitter) which will be your @name. Tips for picking a username: Your username is the name your followers use when sending @replies, mentions, and direct messages. It might be a version of your real name or, if your name is common and most variations of it have already been taken, you might think of a professional and memorable pseudonym. It will also form the URL of your Twitter profile page. Twitter will provide a few available suggestions when you sign up, but feel free to choose your own. Usernames must be fewer than 15 characters in length and cannot contain “admin” or “Twitter”, in order to avoid brand confusion. Avoid using numbers, hyphens and underscores as this will make it harder for people to be able to find you online. Please note: You can change your username in your account settings at any time, as long as the new username is not already in use. 3. On the ‘What are you interested in?’ page Twitter will suggest accounts for you to follow based on your interests. We are going to be covering following people on day 3, so you can opt to ‘skip this step’ for now if you wish. Twitter will suggest up to 40 accounts for you to follow based on your interests, if you decide to proceed. 4. The next stage is to ‘Customise your Profile’. Upload a profile picture (recommended dimensions are 400×400 pixels). When skimming through a twitter feed of all the people they follow, an eye-catching profile picture will help them pick your tweets out. It could be your face, if you have a good, clear shot of your face (useful in identifying you when you meet followers in real life at conferences!). It could also be an abstract image which somehow reflects your @name, as long as it’s striking. Tip! Don’t leave your profile picture as the default Twitter ‘egg’ – this suggests that you are either very new to Twitter or a spammer! 5. The next step ‘Find the people you already know’ gives you the opportunity to connect with Twitter users who you already know. We recommend you ‘skip this step’ for now as we will be looking at following users in more detail on day 3. 6. Your account should now be set up. Twitter will send a confirmation email to the address you entered on sign up, make sure you click the link in that email to confirm your email address and account. Important information about your email address: An email address can only be associated with one Twitter account at a time. The email address you use on your Twitter account is not publicly visible to others on Twitter. The next thing you should do is start to fill out your profile, so that when people look at it, they will feel more encouraged to follow you. To do this click on your profile picture, this will take you to your profile page. On the profile page you should be able to see an ‘Edit Profile’ button. Click it to update your profile. Add your real name, if you wish. This will appear on your profile, so if you use an abstract pseudonym and picture your Twitter account can still be identifiably ‘you’. Add a location (this could also be an institution). Your followers might be from anywhere in the country or the world, so this gives people a bit more context about which university you are affiliated with. Add a ‘bio’. You have 160 characters to sum up who you are and what you might be tweeting about, to encourage people and give them a reason to follow you. Again, a blank or minimal bio isn’t very inviting, and suggests that you are too new to be interesting, that there is little to be gained from following you, or you are a spam account. A well-thought out bio is an important part of gaining new followers. Have a look at the bios on other tweeters’ profiles, and see what you find inviting or off-putting. If you intend to tweet in a professional capacity, then avoid too much about your hobbies or quirky, cryptic statements about yourself. It tells potential contacts nothing about why they might want to follow you and what kinds of information you are likely to be passing on to them, and therefore why they would want to network with you professionally. Some people like to add that they are “tweeting in a personal capacity” or that the “views are my own” to clarify that their tweets do not reflect the views of their employer, although you may feel that this is clear enough anyway. Add a header photo. This will appear at the top of your profile page and acts as cover photo for you Twitter account. The recommended dimensions for Twitter header picture are 1500×1500 pixels. Make the job of sizing and/or designing your header using an on-line service. Last week I was sent a graphic by marketing – I used Canva to resize and add a background to create a new header for @HJSears. People will often view your profile page when deciding whether to follow you, and you might give out the URL to your profile page e.g. on your email signature or business card if you want to ask someone to follow you, so it is worth making it informative and distinctive. More than one Twitter account? You can create more Twitter accounts each linked to a different email address – you are not limited to single real life identities like Facebook or LinkedIn. These might be for other facets of your online life, such as personal contacts, for public engagement rather than networking with other researchers, or for representing a research group or event such as a conference. It’s best not to mix audiences too much – if you use Twitter for a hobby, then a separate account for professional purposes means that you aren’t filling people’s Twitter feeds with things that don’t interest them or confuse them. For example, I’m @HJSears for professional conversations and @Aornis for personal contacts. It’s fine to add a personal touch to your professional tweets though!